Finally I get a chance to experiment a bit with new ingredients! I have been dying to play with some orange blossom water I picked up at Pike Place Market a few weeks ago. 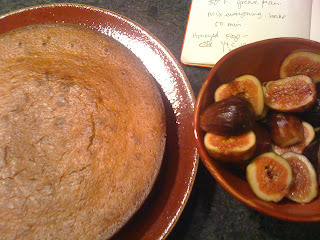 I also wanted to incorporate the figs and found a recipe to mix up a bit online. That recipe had sherry, I had no sherry (who has sherry??) and so I had to change stuff...anyway, it's beautiful and simple and fun. Hope you like it! Pre-heat oven to 350 degrees F and butterspray a pan. You know my style. 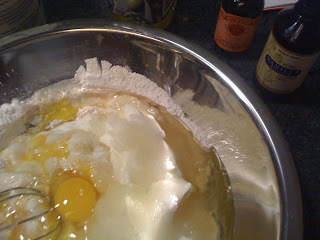 Dump all the ingredients in a bowl and whisk together until it's smooth. I have to add here, orange blossom water is probably not at your local grocery store. It is likely at a williams sonoma or a sur la table or a spice store. Most people make yogurt cake with a tablespoon of lemon rind and I imagine you could get this flavor with a tablespoon of orange rind and a tiny bit of orange juice. Pour into cake pan and shove into oven for 50 minutes. You know, fresh figs are probably just fine here. I also wanted to make candied figs but I had no jars to preserve them. Anyway, this was easy - take it or leave it. 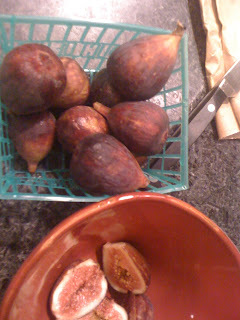 Take the figs and cut off the stems, cut the figs lengthwise. Take the rest of the ingredients and pour into saucepan. Bring to a boil and then reduce to a simmer, covered for 40 minutes. Simmer an additional 8-10 minutes without cover and take off the stove. Pour onto figs, let cool. I'm guessing this will last a little less than a week. The recipe I adapted from said 3 days, but I never believe those things - my lemon curd is still good after 2 weeks in the fridge! Serve on the side of, on top of, or not at all with the yogurt cake. Cheers. Which is it? Yogurt or cake? Ahhhh... I can't take it any more.